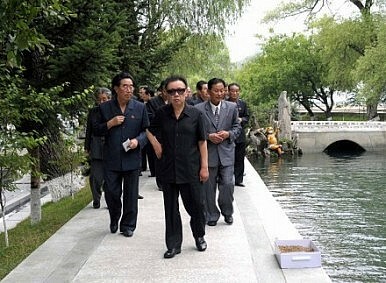 North Korean state-run media is reporting that leader Kim Jong-il is dead. What will happen next? North Korean state-run TV is reporting that the country’s leader, Kim Jong-il, is dead. Propagandized until the very end, the country’s Dear Leader was, it is often said, predictable only in his unpredictability. His eventual death had been talked about with much more frequency since he suffered a stroke in 2008 and largely disappeared from public view. When he did finally appear in public, he looked visibly frailer than he had previously. The presumed successor is Kim Jong-il’s youngest son, Kim Jong-un. But as The Diplomat security analyst Richard Weitz notes, the sudden demise of his father could complicate the succession. Little is known about Kim Jong-un, with outside media forced at times to rely on the musings of the Dear Leader’s former sushi chef for information. As Michael Breen, a Seoul-based analyst and author of 'Kim Jong-il: North Korea's Dear Leader,' once put it: "We actually know zero about this guy." Regardless, last year saw the younger Kim’s effective coming out event for the country, when he appeared at a major military parade. As CBS noted in its report on Kim’s death, he had “been groomed for 20 years to lead the communist nation founded by his guerrilla fighter-turned-politician father and built according to the principle of ‘juche,’ or self-reliance.” The fact that his son has had far less time to prepare, therefore, has inevitably stoked speculation of a possible behind-the-scenes power struggle. The other key question is, as Minxin Pei noted in The Diplomat last year, whether the West is adequately prepared for Kim’s death. The question now is: did they?